February 3rd dawned c-c-c-cold and f-f-f-frosty! Even the inside of the car windscreen was iced up.... And later that day, it snowed again! What's going on?! You know, I'm really over this snow now. Where's summer already?! Great frosty photo by the way! Yes, Amy, this is the coldest winter in about 30 years... I remember the last "coldest winter since..." as well. We had no heating in our house that year. Ice on inside of windows, several blankets on the beds, chilblains on my feet, fainting at the bus stop after standing for 20 mins in the cold! I am so grateful for my nice snug house! The photos are good, Mel. I like the frosty one, and that stroganoff looks yum... you eat such nice meals! Fabulous frosty photo--just love it! Even though it's a great photo....I don't think you should be posting it....you are encouraging the snow.....which is now falling again here. Brrrrrrr! 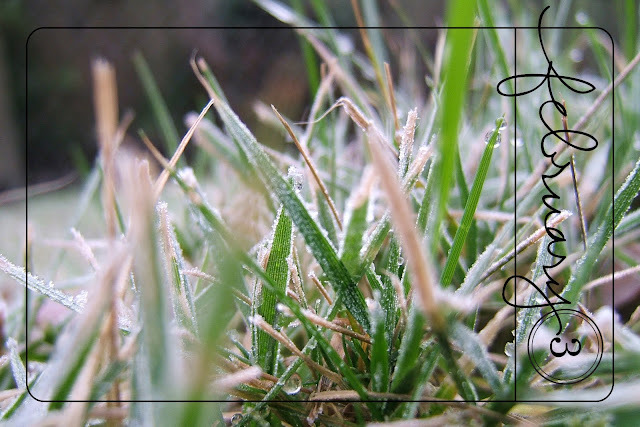 Nice frosty photo of the blades of grass! I was complaining about how cold it was yesterday (Arizona = a light sweater this time of year) and my hubby mentioned that I definitely live in the right place. I could never survive in a climate where it is truly cold! LOL. We've had more snow again today and are meant to be getting more tomorrow and Friday. I'm just glad it's not settling - then I'd be really fed up! I look the look of your leftover leftovers ;). Your food always looks tasty! Like the frost picture and the way you can see the two droplets on the blade of grass. You are very good with your leftovers ~ most of ours end up in the dog's bowl! I had a very similar photo in my Christmas Journal. Great job! I am so ready for summer. I don't like cold!! Brrrr, we have family from the UK flying back today and they are really not looking forward to the cold. Hope you start to warm up soon. The frosty grass is giving me chills! Remembering having to de-ice the car this morning! I like your frosty close up piccy, We went out in the snow this morning and nearly turned ourselves into a snow family!